South African Kevin Anderson and American Michael Russell took the court for a second time with the score tied 1-1 after a five hour rain delay. The two met in the round of 16 at the previous Atlanta Open with Anderson winning the match 6-1, 7-5. Both men were trying to mirror their success from March where Russell defeated world number nine, Mardy Fish, on his way to reaching the semifinals of the ATP Tour event in Houston, and Anderson clinched his second tour finals’ win at the Delray Beach International Tennis Championships. With play resumed, the first set featured strong service games from each of the players. Anderson threatened to break Russell a couple times as he jumped out to a 0-30 lead in consecutive games. However, Russell was able to win the next four points in both games to hold serve. At 4-4, Anderson got his first break point; he failed to capitalize as Russell hit a tough first serve. Up 4-5, Russell had a set point on Anderson’s serve, but a miss hit on his backhand return and an Anderson winner helped Anderson even the set at 5-5. A tiebreak would decide the first set after a hold from each player. Serving at 1-2 in the tiebreak, Russell hit an unforced forehand long to give Anderson the first minibreak of the tiebreaker. Anderson found himself up 5-2, but Russell wouldn’t fold. Two big serves and a passing shot by Russell knotted up the breaker at 5-5. Anderson could not be rattled as he won the next two points and the first set 7-6(5). The first break of the match came at 1-1 in the second set after Russell jumped out to a quick 0-40 lead. Russell proceeded to hit a forehand winner off of an Anderson first serve to go up 2-1. Unfortunately for Anderson, he would not see a break point for the whole second set and lost it 6-4. Consistently powerful serves from Russell was the key to forcing the match to a third set. Carrying the momentum after winning the second set, Russell broke easily in the first game. Another break at 3-1 gave the American a quick 4-1 lead.Anderson later got one of his breaks back in the next game, but he was in too deep of a hole to come back. Russell would hold to win the third set and upset fifth seeded Kevin Anderson to reach the quarterfinals 6-7(5), 6-4, 6-4. 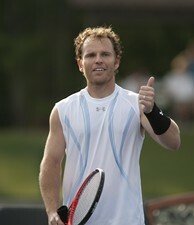 Hoping for continued success, Russell will play fellow American Andy Roddick in his quarterfinal match.